Organic crops are less likely to contain the toxic heavy metal, cadmium, and less likely to feature detectable pesticide levels, as revealed by a British Journal of Nutrition study from 2014. This is one good reason why online retail giant, Amazon, is expanding its Amazon Fresh brand, which sells organic produce, by adding AmazonFresh Pickup (a drive-in grocery delivery service) in select USA cities. But as always, we want to encourage you to buy from local farmers. Organic fruits and veggies are good for your body and they also promote better skin. Today, we want to share information about the complexion-boosting benefits of organic strawberries. Once you’ve discovered how they promote healthier, smoother skin, you may just decide to grow your own. When you do, you won’t need to pay subscription fees to Amazon. Why Are Strawberries So Beneficial? You already know that strawberries are luscious and delicious. If you adore their sweet taste and summery vibe, you’ll be pleased to discover that they provide a range of nutrients which are linked with smooth, youthful and radiant skin. For example, according to the Web MD website, a single serving of strawberries (that’s roughly 8 strawberries) has more vitamin C than you’ll get from eating an orange. Vitamin C is necessary for collagen synthesis (collagen is a building block of skin) and it’s also got antioxidant properties. Antioxidants slow down the pace of skin cell damage. Another bonus of getting plenty of vitamin C from organic strawberries is that this vitamin prevents and treats photodamage from UV rays. According to the Skin Cancer Foundation, UVA radiation which penetrates the complexion plays a prominent role in wrinkling and skin aging. Another skin-smoothing nutrient in strawberries is potassium, which boosts skin hydration. Hydration is the key to pleasingly plump skin that looks and feels younger. These yummy berries also contain manganese, which supports optimal collagen production. The high antioxidant count in organic strawberries is good news for your skin. 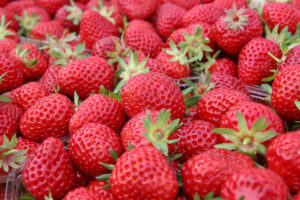 According to Fitday.com, strawberries feature one of the highest concentrations of antioxidants of all fruits. These antioxidants battle free radicals within the body, which damage skin cells, decrease collagen levels and leave skin prone to wrinkles. Strawberries contain a trio of antioxidants, which are vitamin C, anthocyanins and quercetin. Eating just a cup of these juicy berries will provide you with eighty-five milligrams of vitamin C. That’s ninety-four percent to one hundred and thirteen percent of your daily vitamin C requirement. Organic strawberries may be grown in containers, such as hanging baskets. You may also grow them in a garden bed. June bearing strawberries will produce one big crop in the summer (June or July). 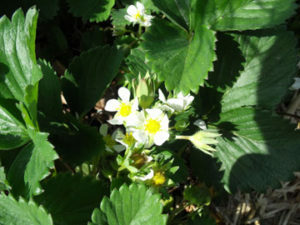 Another option is ever-bearing strawberries, which produce smaller quantities of berries throughout the growing season. Strawberry varieties to consider include Ozark Beauty and Quinault. 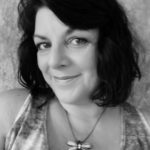 Motherearthnews.com recommends keeping a gardening journal that may be used to track your progress. If you do keep a journal (digital journals are available and they’re very popular nowadays), you’ll find that it makes growing your own organic strawberries more fun.